The photo above was taken in February, 2002 at a Marin County Fire Chiefs Association installation dinner, held at Deer Park Villa in Fairfax . from left-right: Jeff Davidson, later to become Mill Valley Fire Chief, now retired; Kenny Kamp; Signe Lando, wife of Kentfield Fire Chief John Lando, now retired; Bob Mariani, Kentfield Fire Chief, now retired; and John Lando, Kentfield Fire Chief, now retired. Photo by Maureen Forster. Kenny Kamp was born and raised in Kentfield, one of three sons of Dr. Harry and Eva Kamp. His father Harry Kamp was born and raised in Ione, California, at the Preston School of Industry, where his father was the Assistant Superintendant. The school, also known as Preston Castle, was one of the oldest and best-known reform schools in America. It was closed in 2011 by the California Department of Corrections. Harry Kamp became a very successful optometrist after graduating from the University of California, and would go on to practice in San Francisco for over 40 years. For over 20 years, Dr. Kamp served as a part-time member of the faculty of the University of California Optometry Department. He was also past-President of the California State Association of Optometrists, and the Optometry Alumni Association of the University of California. How did the Kamp's come to Kentfield? Charles Bach was very successful in the malting business in the late 1800's in San Francisco, and would later become a major landowner in the Ross Valley. He built a retreat named "Quisisana" in the late 1800's, named after a resort on the island of Capri where the Bachs had stayed in 1884. Quisisana translates to "here you are healthy." The original home burned down in 1901, and was rebuilt in "grand style" the following year. After Charles passed, his grandson Henry sold the Bach Estate in 1946 for $35,000 to Dr. Kamp. The estate then became known as the Kamp property, located at 123 Laurel Grove Avenue. Harry and Eva raised Kenny and his two brothers, William and Martin, in this beautiful rural setting. As a child, Kenny did everything from playing the saxaphone in the school band, to raising sheep. He played on the football team at the new Drake High School, with fellow student James "Jim" Berthinier, who would later serve for many years and retire as the Fire Chief of Novato Fire Protection District. He also played with Bob Marcucci, who would later have a long career in the San Rafael FD, and also retiring as Chief. In 1954, the original thirteen acres of the estate was subdivided, leaving the house on a remaining four-acre parcel. The parcels were bisected by Quisisana Drive and developed into multiple single-family homes. Dr. Kamp was a partner in the development, a 173-home subdivison known as "Laurel". Harry and Eva lived at the estate until 1985. Harry's roots in reform schools and rehabilitating others would continue to grow. Dr. Kamp was a good friend of then California Governor Edmund G. Brown Sr., and after retirement, served by appointment on the California Adult Authority for seven years, including as Vice Chairman. He had previously served as Chairman of the Board of the California Institution for Women at Corona for two years. 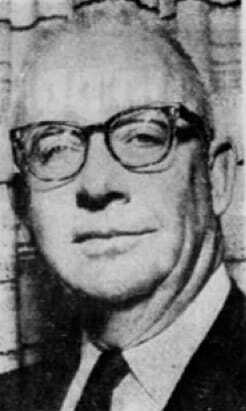 Dr. Harry Kamp passed away in 1967 in Susanville at the age of 62. Kenny Kamp attended the newly built Sir Francis Drake High School in San Anselmo. "I met Kenny and Jim Berthinier when we were Freshmen on the Drake HS Junior Varsity football team in 1953," said Bob Marcucci, long-time San Rafael Fire Chief now retired. "Kenny was the right guard and I was the right tackle. Jim was the running back. All three of us advanced to the varsity, with Kenny and I in the line, with Jimmy the running back. Ken and I used to tell Jim the only reason he was a star running back, was because Kenny and I opened the holes for him. He had other thoughts about that. There were other events that we participated in, which should be left untold. We all graduated from Drake in 1956. It is unique that all three of us entered the fire service and became Fire Chiefs." 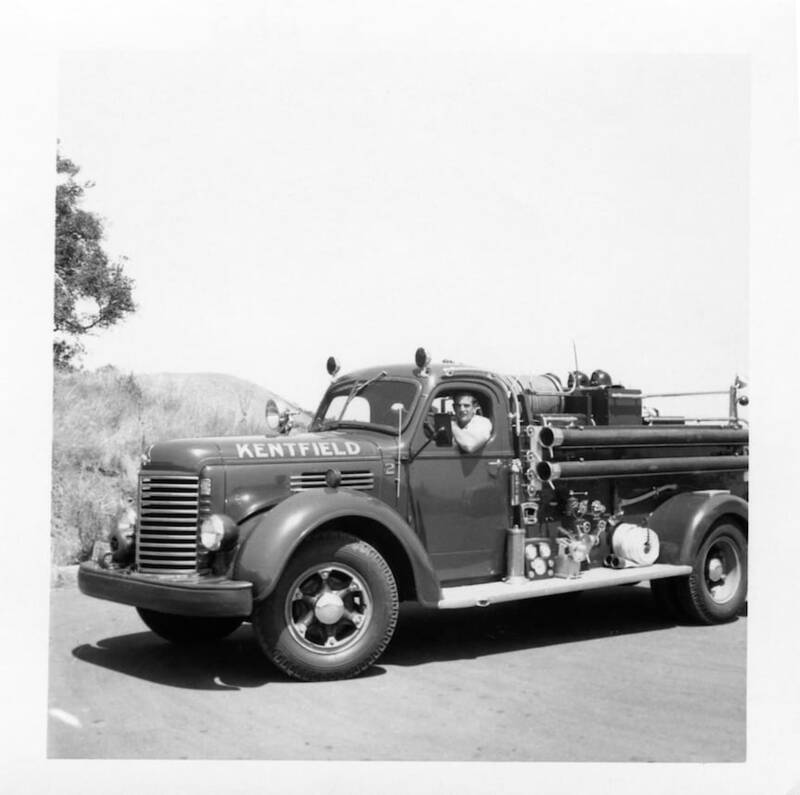 Kenny served in the U.S. Army after graduating from Sir Francis Drake High School in 1956, and then joined the Kentﬁeld Fire Protection District on Sept. 1, 1958. He was very involved in training, and was one of the leaders of developing the fire science program at College of Marin in the 1960s and 70's. October, 1963 was a really memorable month for Kenny. 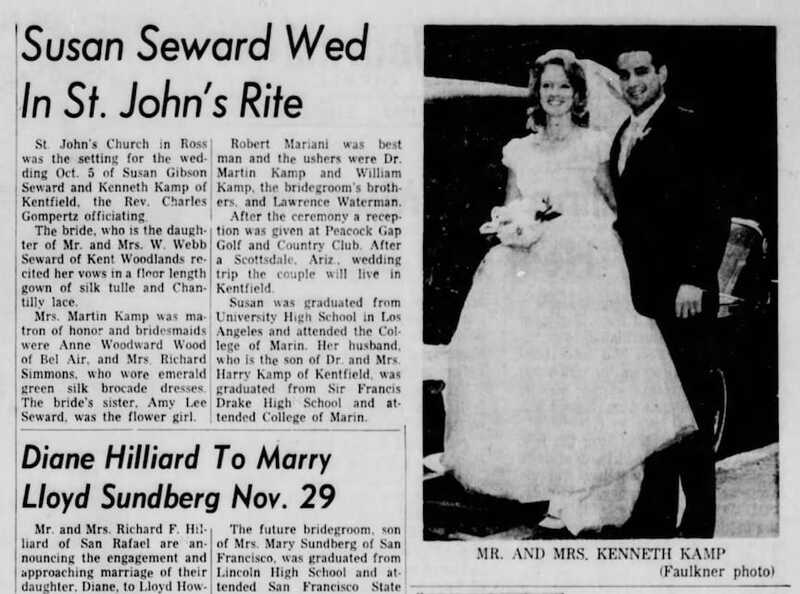 He married the love of his life, Susan Seward, in Ross on Saturday October 5 (see article and photo below.) In addition, while on his honeymoon on October 15, he was appointed Chief by the Kentfield FPD Board. He became one of the youngest fire chiefs in California, only 25 years old. Tiburon Fire Chief Frank Buscher shared that honor, having also been promoted at 25. "When we started out we were young - there was a group of us that were kind of together, you know?" said Frank Buscher, one of Kenny's good friends. "I enjoyed his friendship, he was just an all-around good guy." The year of 1963 ended with a 'bang' when on December 16, young Chief Kamp faced what would be one of the largest structure fires of his career, just down the street from the fire house. The old College of Marin Gymnasium, slated to be torn down and replaced soon, burned down instead. Read about this fire under our Major Fires menu, Structure Fires, 1963. During his 28 years as Fire Chief, Kenny oversaw construction of a new ﬁrehouse in the late 1960's. The new, modern facility was featured in national fire service magazines as an example of efﬁciency and elegant design. 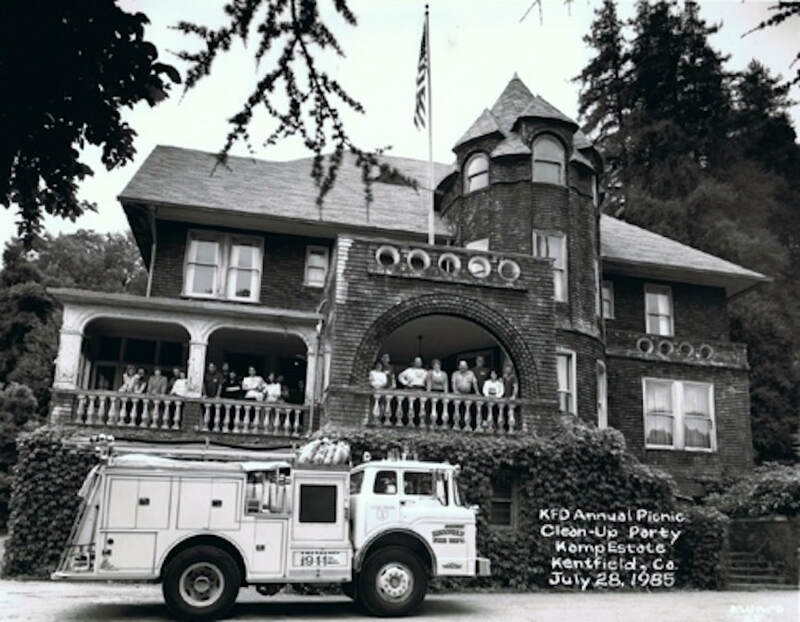 "The Kentﬁeld ﬁre district ﬂourished with an active volunteer program, additional full-time ﬁreﬁghters and modern, and state-of-the-art equipment," said Kentﬁeld Fire Chief Paul Smith, now also retired. Another large fire during his tenure happened in Kent Woodlands on October 7, 1972. A wind driven brush fire threatened many homes and heavily damaged one. Kenny called for help from all over the County, and also from Petaluma and San Francisco. Kent Woodlands was saved. This fire will be featured in our major fires section soon. Kenny served as President of the Marin County Fire Chiefs Association in 1974. He was installed by retired San Rafael Fire Chief Vance Trivett. Kenny was a talented woodworker, and hand-made the perpetual plaque with gavel that lists all of the past-Presidents of MCFCA. Kenny also loved working in his vegetable garden, growing his own crops and giving much of it away to friends. He had a weekend retreat in Ukiah, where he often invited friends including many retired fire service members to BBQ's and gatherings. "He was a true family man," said his wife, Sue. "He loved his animals, he loved his football and he would do anything for anyone if they needed it, and he will be sorely missed." 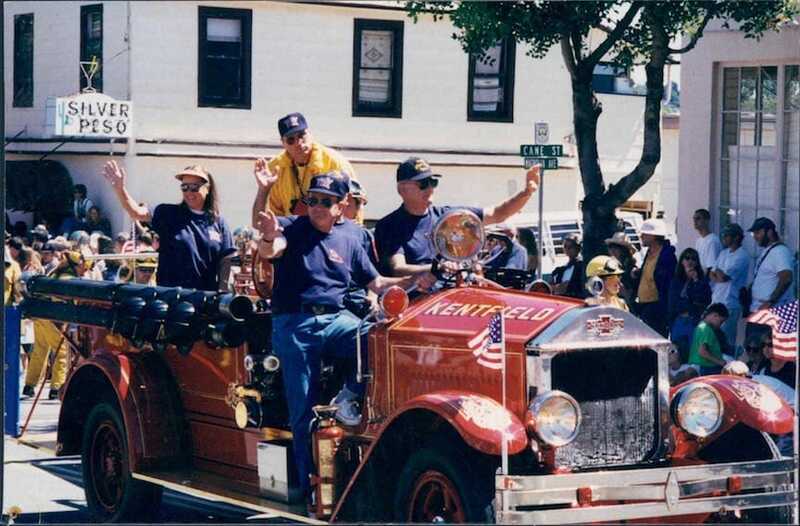 Kenny would spent 32 years in Kentfield FPD, serving 28 of those years as chief until his retirement in 1991. Kenny passed away on February 2, 2009. Bob Marcucci added "Kenny could be described as a good soul, who always looked for the good in people, and he was tolerant of those who didn't see the world as he did. He enjoyed having fun with his friends and the outdoors. In his quiet way he was passionate about the fire service and worked in his own way to improve the fire service and his own department. He was a good friend." "He was beloved by his family and friends. He will be missed for his generosity and his fun spirit and for all the vegetables that he grew and gave away to friends. He loved his garden, which he spent much of his time tending to. When he wasn't out in the vegetable garden he was watching a football game or some other sports on TV. And he loved his family, especially his granddaughters. He is survived by his wife of 45 years, Susan Kamp of Novato, his son Tom Kamp, Tom's wife Cyndi, their two daughters Daisy and Ginger, of San Jose. Also survived by his daughter, Stacey Kamp of San Anselmo, his brother Marty Kamp of Larkspur and his cousin Babs and her husband Bill Burnett of San Anselmo. And of course his dog, Charlie, who was his best friend and constant companion. Services were held on Saturday, February 28th, 2009, which would have been his 71st birthday." 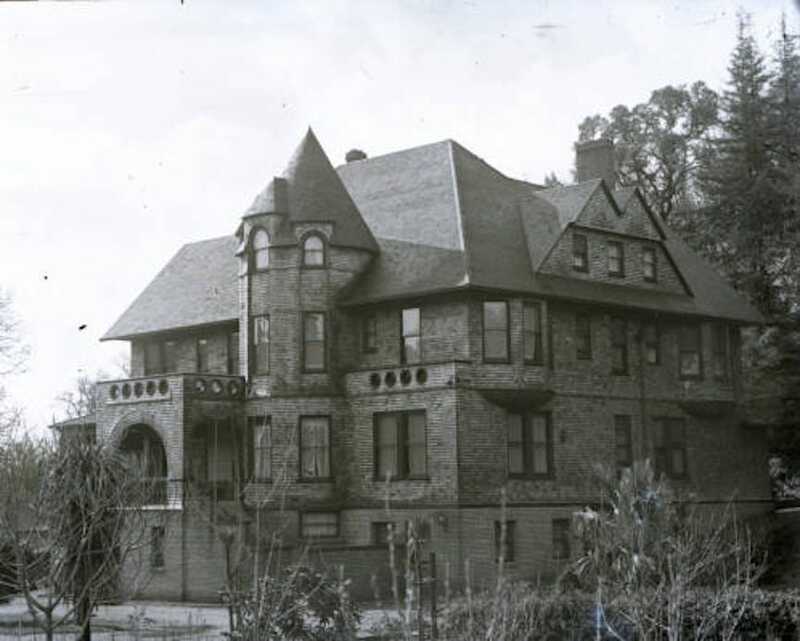 The Charles Bach home on Laurel Grove in Kentfield, circa 1902, that would later be where Kenny grew up. The original home was destroyed by fire in 1901. Photo courtesy Anne T. Kent California Room, Marin County Free Library. A story from November of 1959. 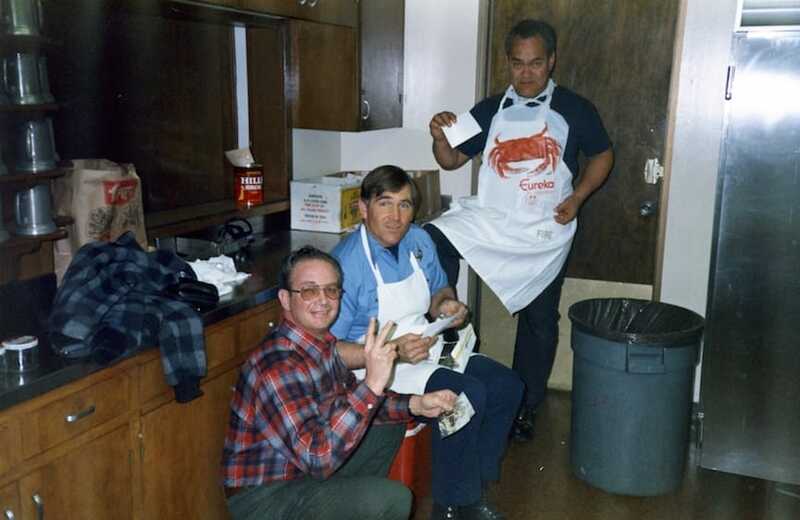 Kenny, Firefighter Elmer Collett, and Firefighter Tiki Morris in the KFD Kitchen. In the Twin Cities 4th of July parade in Larkspur. PLEASE HELP Identify those in the photograph above that includes Kenny. 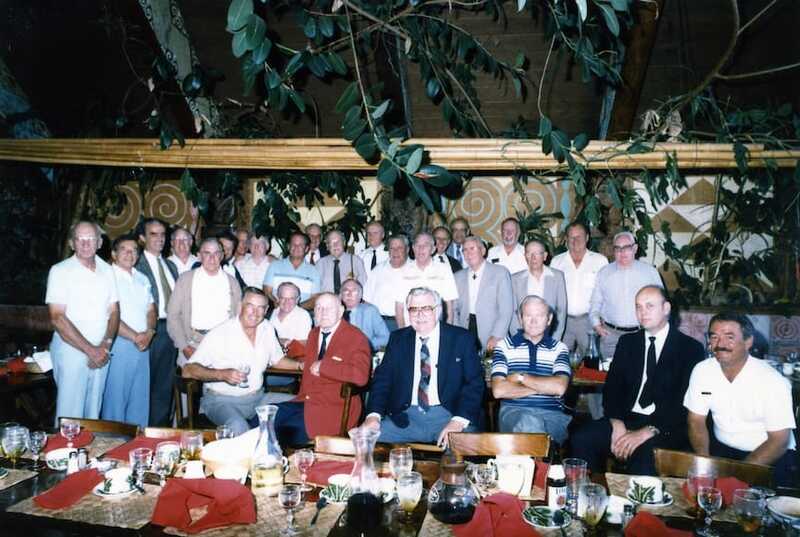 According to retired Sausalito Chief Steve Bogel, this was taken at an early gathering of the FELLA's group that Tiburon Chief Frank Buscher organzed for retired members - Fire Executives of Long Long Ago. The photo was taken by retired Alto Richardson Bay Chief Carl Heynan, and the event was held at Tiburon Tommies. Retired Tamalpais Valley FPD Chief Bob Souza thinks it was about 1979-80. Photographs below are from Kenny's Memorial Service held February 28, 2009 at Mount Tamalpais Cemetary in San Rafael. Question: How would you describe him to those who did not know him? "He was well liked and respected by all the firefighters, he had their backs and we had his. I never ever heard anybody speak negatively about Ken. That's the truth. We supported him 100% even when the board of directors were challenging him. He was very compassionate and thoughtful. He would always offer his help on and off duty. There were a good 100 plus uniformed firefighters from around the state that attended his funeral. That is a testament to the person he was." Q: What were some of his contributions to Kentfield and beyond? "Ken made sure that the communication between the other agencies was positive. You will remember, back in the 70's and 80's all the agencies were still self-sufficient. We all had lots of volunteers and for the most part could handle the calls with our own members. He made sure we participated in any county functions to maintained our positive relationships with our neighbors. Keep in mind Kenny was born, raised and lived in Kentfield, so this was very positive for the district. If the district needed any support from the citizens he know them all back then. His dad was good friends with California Governor Jerry Brown, Sr. and this was also helpful to the district." Q: Do you have a favorite Kenny story? "There were always some type of 'positioning' going on with the paid men and the volunteer's (aka, 'grab assing'.) I remember one night, the paid guys pulled an 1 1/2" hose line and stared a water fight on the second floor of the station. The volunteers went around the building and pulled another line off the same rig and brought it up the back stairs and the fight was on. It took all of us hours to clean up the mess. The next morning when Chief Kamp reported to work he walked up stairs and sat at the kitchen table like did he every weekday. The first words out of his mouth were, "...hey guys, the station looks extra clean this morning..." We didn’t say anything. The Chief went downstairs and about five minutes later, he called everybody to his office. Oh man, we did not know what to do. He makes us all crowd into his office (there were about eight of us), he points to the top of his desk and there is a puddle of water and it is still dripping. The only thing he said was "who won?" and he smiled." "I first met Chief Kamp when I was in grammar school. He lived in the neighborhood that I grew up in, and one day before the 4th of July my friends and I were setting off a few cherry bombs and one of them went off just as Chief Kamp was going by in his Chief's truck. He stopped and gave us a lecture on the hazards of illegal fireworks, and talked about injuring ourselves or a family member. He invited us down to the firehouse before he left and we all were relieved that we didn't end up in juvenile hall. He would always toot his horn when he saw us after that day." Q: How would you describe him to those who did not know him? "Chief Kamp was a firefighter’s fire chief. He was very proud of his department and would do anything for his firefighter’s. He was very giving of his time to the community and was the communities 'go to' guy." "I think Chief Kamp's legacy was the incredible volunteer firefighter program he was able to develop and maintain for so many years. The volunteers were welcome and encouraged to come in and train with the full time firefighters at any time. There was really no separation between the full time firefighter’s and the volunteers. Looking back I can say this was due to Chief Kamp's leadership. I know Chief Kamp was very proud of the number of volunteers that became full-time firefighters throughout the department’s in Marin." ​"Chief Kamp was really a jokester. One day a few of us were heading up to Kenny’s weekend ranch in Ukiah. We were riding in his Toyota Land Cruiser and he said to us 'watch this.' We were just about to pass a family with kids in the car and he pulls out this gorilla mask, puts it on and looks out as he’s passing the car. He turns his head towards them and the kids are freaking out and he can’t stop laughing. He loved the role of a jokester." "Kenny was a remarkable person and Fire Chief, who helped shape our fire service as we know it today." ​ - Steve Bogel, Sausalito FD Chief, retired.